Kantar Worldpanel ComTech, the WPP market research division that provides a rolling check-in on how smartphones are selling in key markets, has put out its latest figures this morning covering the 12 weeks that ended October 31. It looks like the debut of new iPhones from Apple have given the company a “signficant bounce” in sales. But even with the launch of not one but two new models — the colorful 5c and elegant 5s — the impact of incremental upgrades has not been as strong as last year’s debut of the iPhone 5. 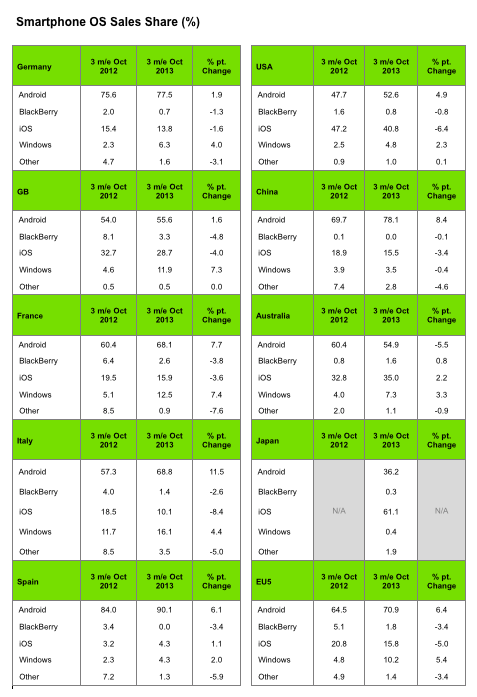 All in all, Kantar says Android took 71% of all sales across 12 key markets versus 21% for the iPhone. Specifically, in important markets like the U.S., Android took nearly 53% of sales. In Europe, Android accounted for nearly 71% of sales collectively across Britain, Germany, France, Italy and Spain. In comparison, last year’s iPhone 5 debut was strong enough that it helped Apple find its way to the top of smartphone sales in the U.S. over Android. This year, although some had predicted a similar spike, Android held off Apple at the pass, with Apple at 40.8% for the three-month period in the country; in October alone, however, Apple had 52.8% of sales. The trend in the U.S. was played out across other markets as well. That’s not a universal picture, however: Apple continues to positively storm in Japan, where it is now at 76.1% of sales, thanks to NTT Docomo, Japan’s biggest mobile operator, now also carrying the iPhone. On the other hand, certain countries in Europe continue to remain challenging for Apple. In Spain, for example, over 90% of handsets sold are Android devices. Apple, in fact, is now level with Windows Phone sales, at 4.3% (!). The UK market, which has traditionally been a stronghold for Apple in the region, is an example of how Apple may be content these days simply to continue selling well in the premium market, and leave the low end for the rest to fight over. In Britain, Kantar notes, Apple took only 28.7% of smartphones in the three-month period, but that was with sales being led by the expensive 5s model, which was outselling the 5c by three to one. Britain is an important barometer market for companies like Apple and Samsung. The country as of October has 68% smartphone penetration; 86% of devices sold in the past three months were smartphones. However, that’s not yet bearing fruit in China, where Nokia has also lavished attention on low-end Lumia models (its first in the market, in fact, came out there). Indeed, it will be Microsoft calling the shots from now on. It will be interesting to see if, by controlling Nokia’s destiny more directly, it will be able to turn that boat around.